Pets with broken or fractured teeth are an extremely common presentation for veterinarians world-wide. At Dental Care for Pets we see at least one case daily. The large premolar and molar teeth in dogs are typically injured from chewing hard objects. The canine (fang) and incisor teeth are frequently fractured from trauma, including major trauma like a car accident and less obvious trauma like pets fighting or playing roughly. In cats, it is particularly common to see fractured upper canine teeth following facial trauma while fractures from chewing objects is uncommon. In order to determine a successful treatment plan, it is important to establish an accurate diagnosis, including the extent of the fracture, the cause, the time it occurred and the age and breed of the pet. We have attached a flow chart to this web site that can be used to determine the type of fracture and the possible treatment options that you and your Veterinarian can use as a guide when you decide to become a patient at Dental Care for Pets. The extent of a tooth fracture may involve just the outer enamel or it may extend into deeper structures such as the dentine or pulp (nerve and blood supply). 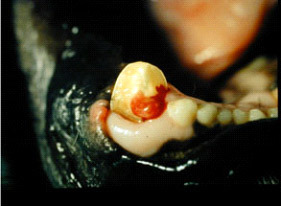 Photograph of a fractured maxillary right 4th premolar tooth in a dog with enamel loss adjacent to the gingival margin entending into the sulcus. There is a white #2 retraction cord placed into the gingival sulcus. 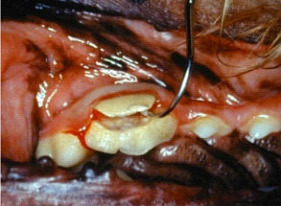 Photograph of a fractured mandibular right canine tooth in a tiger with loss of the crown extending into the underlying dentine and exposing the pulp tissue. The pulp is the large red area in the middle of the tooth and the fracture extends subgingivally on the mesial/rostral surface. Treatment of enamel and dentine fractures may involve smoothing the rough edges and a composite bond or restoration. 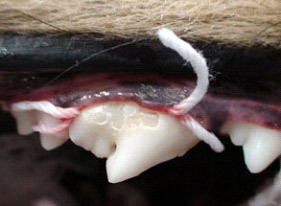 Immediately after a fracture with pulp exposure, the pet exhibits pain and bleeding and successful treatment involves using ‘direct pulp capping’ techniques within 48 hours of the incident. After this time frame, a long-standing fracture will have resulted in the pulp tissue becoming infected and non-vital (dead). The non-vital exposed pulp is often not apparent as calculus (tartar) may cover up the fracture site. Additionally, the non-vital tooth may have an abscess or osteomyelitis (bone infection). Misconceptions and misunderstandings in veterinary dentistry are commonplace. Some veterinarians are unfamiliar with modern dentistry and treatment options available for fractured teeth. The attached flowchart will give you a guide on the possible treatment options available for your pet. Many pets benefit by saving teeth rather than having them extracted. More information may be found in the ‘What you need to know about Root Canal Treatment’ attached to this website.